Now that you have considered the relevant areas to your particular solution, it’s time to assess which elements pose the biggest risk to you deliverable; there is no secret to how you approach this, here at nFocus we use pretty much an industry standard “Risk Based” approach. Another list of items to consider, but at this stage you should have a pretty good idea of the shape the solution will take and the infrastructure and products that will support it. Some of the work identified during the risk assessment will be undertaken by engineers; some could be delivered as part of a contract via a hosting company for example, however you should assess what level of governance to apply to these activities; confidence in the end product for your stakeholders is paramount. What mobile device/os combination should we test on? So, at nFocus we have been doing plenty of mobile app type testing lately and I thought it would be useful and interesting to give you an insight into one particular problem that we have been hitting : What device/os combination do we test on? I was asked recently to estimate the testing effort as part of a bid for the development of an app that would be based on the apple iOs platform. The first thing to consider was, what are the devices and os combinations that are possible. The result is shown below, there is some great information on wikipedia that helped with the collation of this. What we found really suprised me, a test would have to be run 74 times on individual device/os combinations. Clearly, that was never going to be possible, so the question is, how do you get smart about which ones you should attempt? The answer to this is not so clear, and depends on whether there is an existing user base, from which data can be extracted. In this specific case the answer was no, so we had to take a pragmatic approach and pick some major combinations to always test on and a more exhaustive list to execute tests on toward the end of the cycle. For our purposes, we got away with testing on 3 device/os combinations with a final pass being executed on an additional 7 combinations. One of the most important things to consider in making these decisions is to engage the customer, they must be happy with the subset that is chosen and the reasons why. We've come a long way from the days of testing coming last, after report generation, within the development lifecycle. Agile development practices and tooling have reaped many benefits but how do we ensure that testing is integrated end-to-end throughout the lifecycle? How can testing benefit from the same high class tooling and become a first class citizen? Session 1 - “We want to be together”, why is it important that test is integrated into the application lifecycle? Session 2 - Demo… A day in the life of a tester and a developer in the world of Visual Studio 2010, in the Azure Cloud. To find out more, and to book your place, please click here. Okay Azure, here I come! Hello out there in the testing world, I've been busy developing new relationships of late and so I have not had time to get my hands dirty with any testing or test tool work. But that is all going to change now. I've got a couple of presentations coming up and in an attempt not to regurgitate the same old testing drivel, I have opted for a more practical demo- type presentation around cloud application testing. I'm going to be developing it over the next couple of weeks using Azure, so if I come across anything useful, I'll keep you posted. September Software Testing Strategy Workshop date announced! nFocus have announced a September date for the next Software Testing Strategy Workshop to be held at Intellect (the Technology Trade Association), Russell Square, London. We only have 10 places available for this course, and we would encourage anyone interested in attending to book early to avoid disappointment. For more information including course details, discounted rates, course testimonials, and more, please click here. Brad Brooks (Corporate Vice President, Windows Consumer Marketing) introduced some of the Personal cloud stuff and I have to say it sounds great. All your consumer devices interconnected with your own personal cloud, syncing seamlessly, it’s like live mesh on steroids! They demo’d Kinect™ for Xbox 360 which went down a storm with the audience but I’m glad I have mine on pre-order, can’t wait for November, this device really rocks!! My personal fav, Kevin Turner COO for Microsoft, I always love this guy and this time round he did not disappoint. He attacked their competitors Apple, VMware, Linux, Oracle and Google and painted a picture of how Microsoft's strategy for mobile, desktop and cloud will allow them to beat their top competitors. Turner also described market share gains against Google, VMware and even Apple (picture below taken on my Apple iPhone 4)! I have to say one of the highlights for me was the UK party, a much sought after event with people from all over the world trying to gatecrash (they did let Jon Roskill in though). It was a 007 Casino Royal theme and everyone had a great night although I wasn’t to sure why they had a Dame Edna Everage impersonator roaming round, that was somewhat surreal! Danny Crone (Technical Director for nFocus) and Jon Roskill (Corporate Vice President for the Worldwide Partner Group) having a good time at the UK Bond Party. Oi! What happened to my test results??? Hi Guys, I’ve been busy working on an agile project in the city using VS and TFS 2010 and thought I would share one of my experiences as we stood to lose some very valuable information as a result of a default option that is not that obvious from the get go! I have reported the issue to MS and they are going to change the default option in future releases. After a lot of digging around in all kinds of places, I decided to check the build definition that we were using and noticed something I hadn’t noticed before…..the retention policy, it was set to keep only the last 10 successful builds! I was onto something!! It appears that the default (certainly under the MSF for Agile template) was to delete everything INCLUDING TEST RESULTS!!! The good news was that we hadn’t lost too much and the option can be modified to delete everything else but the test results (screenshots below). This is the build definition, please note the "Specify what to Delete" option in the drop down. 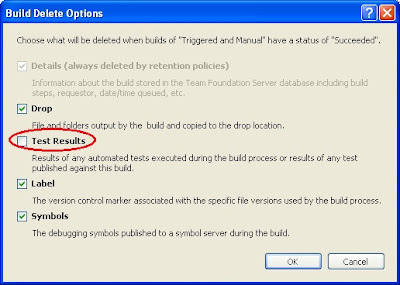 Here, you can uncheck the Test Results check box to ensure that they don't get deleted along with the build. 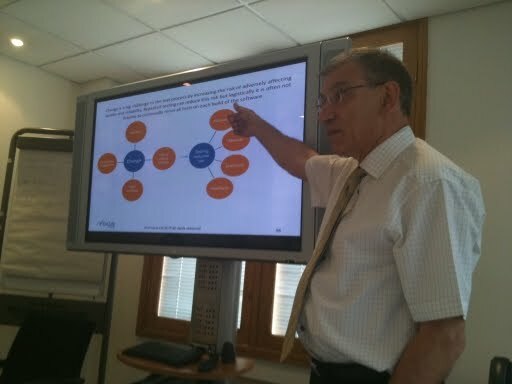 As you may know, nFocus facilitated a Test Strategy Workshop in conjunction with Intellect on the 28th April 2010. The demand for the workshop was incredibly high, and was sold out weeks before the day. The day was facilitated by one of our Principal Consultants, Sam Clarke (featured in the photo above). It was interesting how the audience encompassed a wide range of positions including directors, heads of development, QA, and operations. Both Sam and I agreed it was refreshing to see some of these senior people taking an interest in the value of testing. The format of the day was made up of talks, exercises and discussions. This format worked well allowing tips, approaches and information to be freely traded by likeminded people as well as Sam’s impressive knowledge, expertise and helpful anecdotes. “An enjoyable day, It was very satisfying to work with a group of open minded and receptive IT professionals who also contributed to the session” said Sam after the event. So all in all, a really useful, and interesting day. Due to the overwhelming success and high demand for the course, we have scheduled a number of other Test Strategy Workshops, for more information please click here. We ended up running the session in one of the two main speaker rooms, and a spare seat was hard to find. In all I would guess we had around 50 people in the room! (nerves I hear you ask? Yes a healthy amount!) In any case, it was great to see so many people interested in a testing session at an architect’s conference. I have put a copy of the slide deck up here for reference but I was pleased that the session provoked plenty of questions around architecting solutions in agile projects with a focus on testing. Much of the questions seemed to be around unit testing, test driven development and automated testing and it seemed that some people are still getting some resistance to performing unit testing even though this is, in my opinion, a cornerstone for agile projects. I stayed at the end for the networking and was glad that I did, as there was plenty of people who sought me out to discuss some of the challenges that they were facing. I am hoping to record a re-run of this session as a video blog article as soon as possible, although I can’t promise it will be up there in the next week because I simply can’t find the time- sorry guys. In the mean time check out the Microsoft page for further event information and watch this space. As ever, if you have any questions, please feel free to comment or tweet me @dannycrone. VS2010 - Test Impact, one giant leap for testkind! Hi there, finally got round to another blog article; this one is in the form of a vlog. 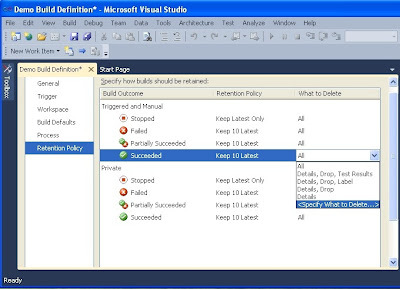 In the agile world, understanding the impact of code churn is vital, using the test impact collector in VS2010 testers can be told which manual and automated tests need to be rerun, I've put together this demo to show it working. Soo...full screen the video, sit back, enjoy and please give us your feedback! Please note the full screen button is located next to the progress bar and volume controls whilst hovering the cursor at the bottom of the video. I thought this may be of interest to some of our community. "Reduce risk and increase your confidence that the quality of your software product is at a known quantifiable level." This course takes you through the key aspects of forming a test policy and strategy allowing you to establish your weak and strong points and a plan of action. In essence a process of “getting to know what you don’t know” so that informed decisions can be taken on appropriate investment in testing. The workshop approach allows interaction between attendees establishing common issues and their solutions. The class will be run as a sequence of short talks each followed by an interactive session allowing delegates to focus on areas of common concern. In addition to class material the key discussion points from the day will also be documented and circulated to the attendees. Want more information? Please click here. 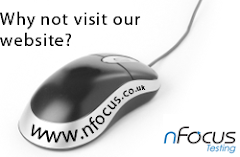 Sorry we have been so quiet on the blog front at nFocus recently... it has been a really busy period! We hope to have a new video blog post on here shortly, along with a series of articles around VS2010, so please watch this space! This is a short post to let you know nFocus and Microsoft will be facilitating a session at this year's Test Management Summit (27/01/2010). The challenges of applying test discipline in the world of agile projects continues to be problematic. The session will explore how tightly integrating testing into the application lifecycle can protect the reputation of the business. This approach will be demonstrated using a state of the art Application Lifecycle Management tool which supports development and testing in a dynamic changing environment. For more information and booking details click here.